This model describes the human cardiovascular dynamics under an impeller pump type ventricular assist device (VAD) support using lumped-parameter modelling, based on the concept of hydraulic-electric analogue. The original model was implemented using C language. Due to the difference of description language and procedural language, some features such as the heart valve dynamics can not be realised effectively, and have to be simplified in the current CellML implementation. The current CellML model implementation runs in OpenCell. The results have been validated against the original C implementation as well as those published data in literature. 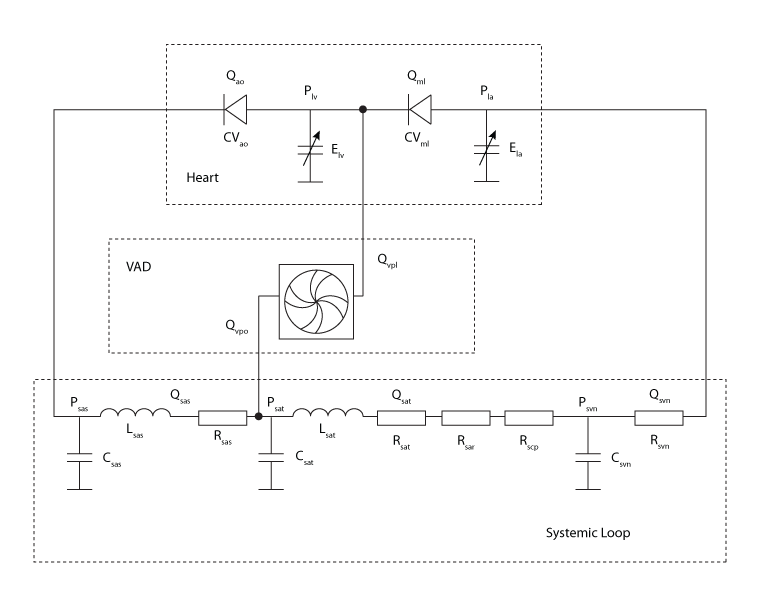 The model comprises three main parts: the heart, the systemic loop, and the impeller pump VAD, as illustrated in the figure below. The heart is modelled as a two-chambered pump with variable elastance and two heart valves to control the direction of blood flow. The systemic loop is sub-divided into a number of segments, namely: the aortic sinus, artery, arteriole, capillary and vein segments. In each segment, individual components are modelled by representations of the local resistance to blood flow, vessel elasticity and the inertia of the blood. The impeller pump VAD is described by the pump characteristics of pressure-flow curves. A concentrated parameter model for the human cardiovascular system including heart valve dynamics and atrioventricular interaction, Korakianitis T, Shi Y, 2006. Medical Engineering and Physics 28, 613-28, PubMed ID: 16293439. Numerical Modeling of Hemodynamics with Pulsatile Impeller Pump Support, Shi Y, Lawford PV, Hose DR, 2010. Annals of Biomedical Engineering (e-published ahead of print), PubMed ID: 20232153. Derived from workspace Cardiovascular Circulation IVad at changeset 556658090b45.